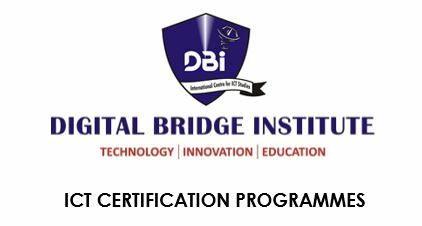 The Digital Bridge Institute (DBI) is pleased to announce the availability of key ICT certification courses designed to equip participants with the skills required to enhance their professional profile, expand their opportunities, and prepare for in-demand ICT jobs. Courses are delivered at excellent standards and offered at highly competitive prices, with internationally recognized certifications. Interested participants should register for any of the following courses which are on offer. Fees cover Tuition, Tea break and Lunch, but do not include Certification fees which will be subject to the dollar rate at time of payment. DBI will award certificates to participants who complete their course to specified standards. Application opens on Monday, April 23, 2019. Classes resume across Lagos, Abuja and Kano campuses with two sessions 9:00 am to 1:00 pm and 3:00 pm to 7:00 pm respectively.